Firefighter Christopher Santora received a perfect score of 100 on both the physical and written tests for the FDNY. He had joined the department in February and was still a probie. He gave up an early career as a teacher to become a firefighter, following in the footsteps of his father, a retired Deputy Chief. His shift had just ended that Tuesday morning, but he jumped on his truck and rode in heavy with his crew. Like so many of his fellow firefighters, his community renamed a street for him after 9/11. They also named an early childbood school in his honor. 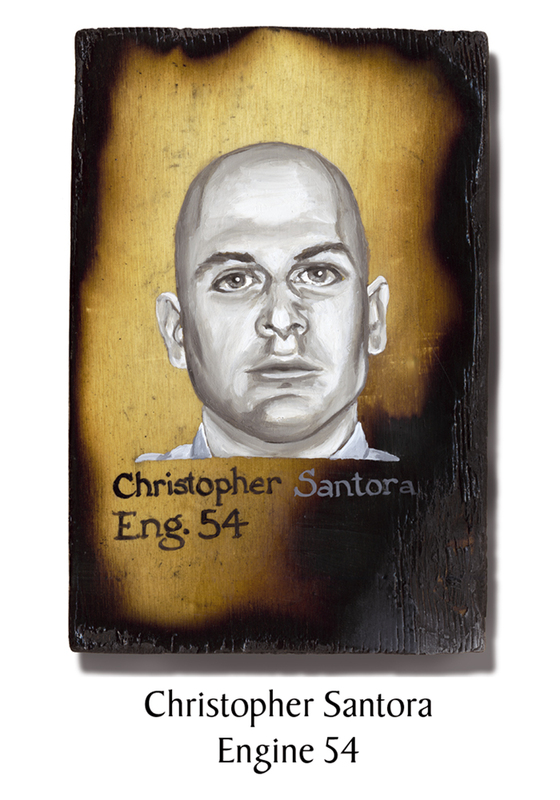 This entry was posted in Better Angels Stories and tagged 343, 9/11, better angels, Christopher Santora, Dawn Siebel, Engine Co. 54, FDNY, firefighter, firefighters, firefighters of 9/11, LODD, Manhattan, memorial, NFFF, paintings, portraits, World Trade Center, WTC. Bookmark the permalink.